and Park Department providing free hot dogs and popcorn. Estuary Park was created in order to provide a park space that encourages athletic activity among people of all ages and abilities. It will feature a multi-purpose synthetic field suitable for lacrosse, soccer, rugby, and football along with a synthetic turf field suitable for baseball and soccer. Accessibility was prioritized when planning the park’s 8 acres, reflected in the game to be played at the ribbon-cutting ceremony. Before the park was constructed, it sat on a plot of land originally dedicated for the U.S. Naval Base. Before then, it was used by the Navy as an athletic site. Now, it will act as a space for the community to gather. In addition to sports fields, the park will provide playgrounds, picnic areas, and a dog park. The city contracted Verde Design to design the layout of the park. The award-winning firm is renowned for its urban look, having planned many college campuses and sports arenas, including those at San Francisco State University. The team, guided by core beliefs in “environmental stewardship, social responsibility, outstanding client service” reflect the values of Alameda taxpayers. You can find out more about the group here. Hopefully, what was once a weed-covered plot of land will soon be able to accommodate diverse athleticism upon the island. The area once burdened with disrepair will soon light up with another game well played and another afternoon well spent outdoors. 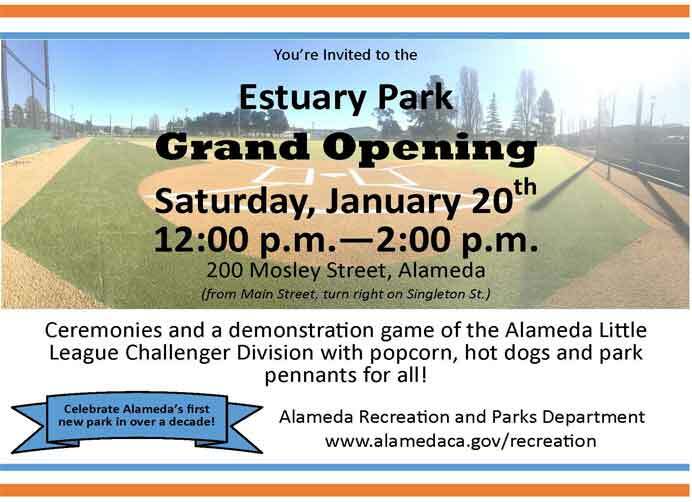 For more information, check this link or call Alameda Recreation and Park Department at 510-747- 7529. You can visit Alameda Recreation and Park Department’s page here. Even if you can’t make the event, you can enjoy the park anytime, as it is currently open for use. You can access it from the estuary side of Alameda, east from the Ferry Terminal.